A rose-red city half as old as time. These these words sound like the opening lyrics to a love song. Instead, poet John Burgon penned them in reference to an ancient civilization and ancient city. 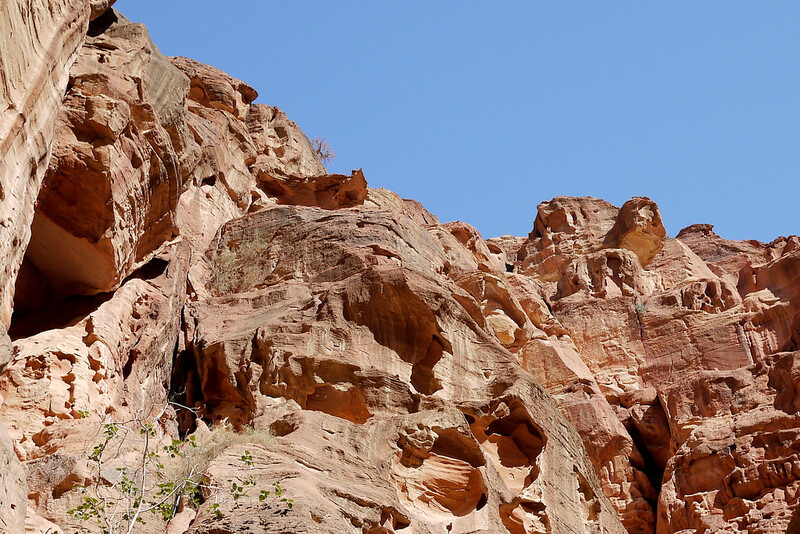 The words conjure images of a civilization that carved their history into the soft sandstone rocks jutting toward the gentle blue Jordanian skies. For several days, I drove through the sandy roads of Jordan. Miles of nubby domes and eroded mountains dotted the horizon as we approached the southern region of Jordan. 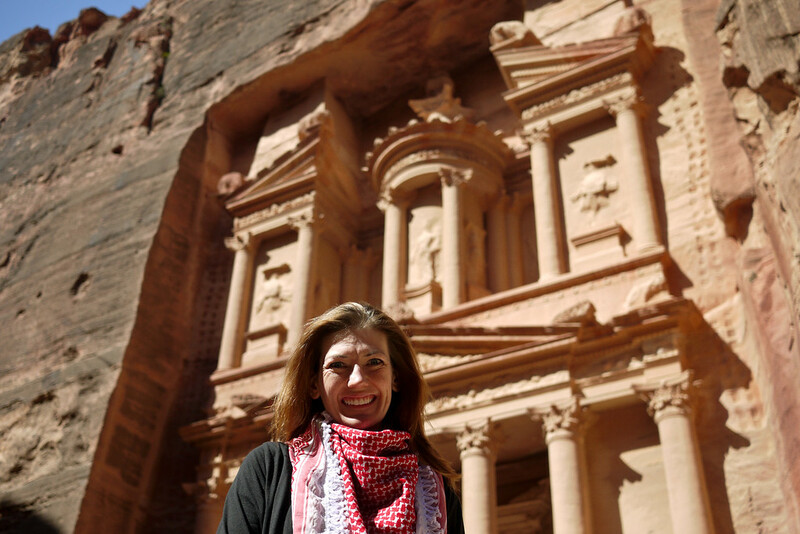 The moment I stepped foot into the rocky swath of land housing the Petra ruins, the beauty overwhelmed me. Surrounded by their city, a wave of curiosity swept over me about this ancient civilization. Why did they carve beautiful structures into the side of the towering rocks? Why is the evidence still here a full two thousand years later, even though it’s carved into delicate sandstone? I was curious about Petra before we arrived, and once there, the answers to my many questions depend on who you ask. Ask a historian and he’ll point you to ancient religious texts and the scarce written accounts that still exist from philosophers of the time. The archaeologists point to their excavations and aerial imaging mapping out the remnants of city still buried under the sand. And the mythologist? Well, he instead gathers stories, legends, the tales passed down through time and shaped throughout history. But with the lens of hindsight on all the information I absorbed while there, I’ll instead share what it’s like to visit Petra through a happy lens of all three meshed into one. What can we learn about this beautiful sight through a lens where history, archaeology, and myth meet in a still partly unexplained ancient mystery. 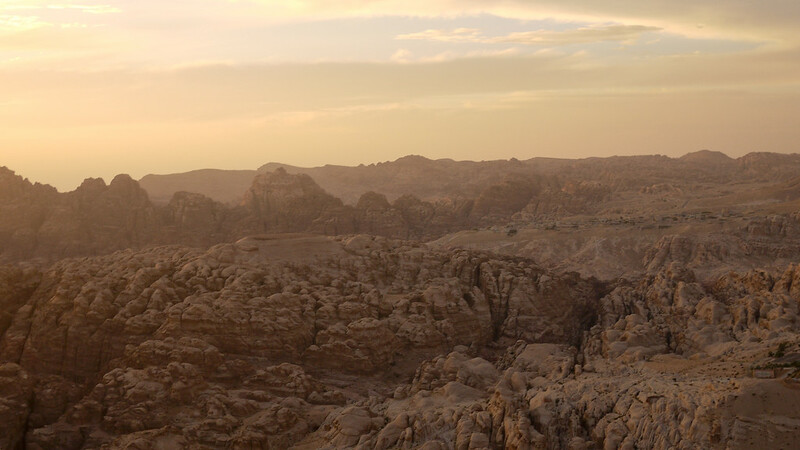 The views over the Petra valley spread wide from my thin ledge at a small park in Wadi Musa, Jordan. The deep shadows of early evening accentuated the towering height of the rocks. 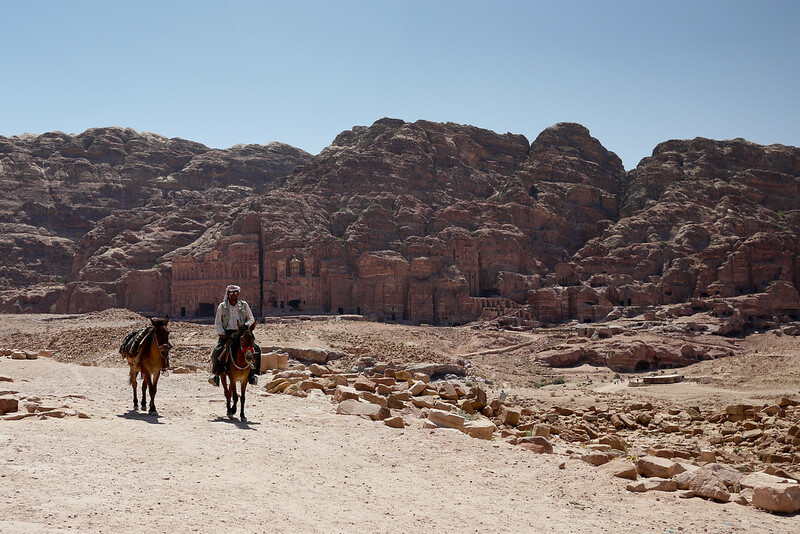 Just minutes into our Petra journey, and already we’re confronted with one of the myths suffusing this ancient city. We’re spending the night in Wadi Musa, which means the Valley of Moses. 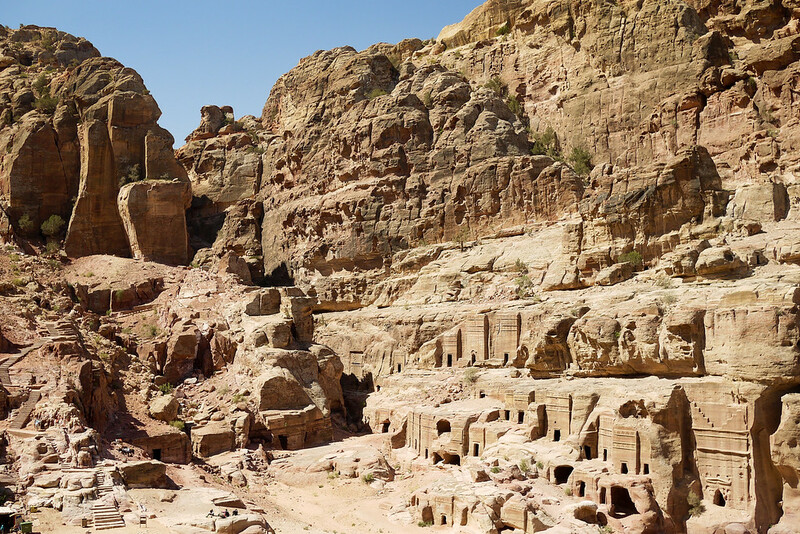 This small tourist town is one closest to Petra and it shoulders a tenuous connection to the biblical past. 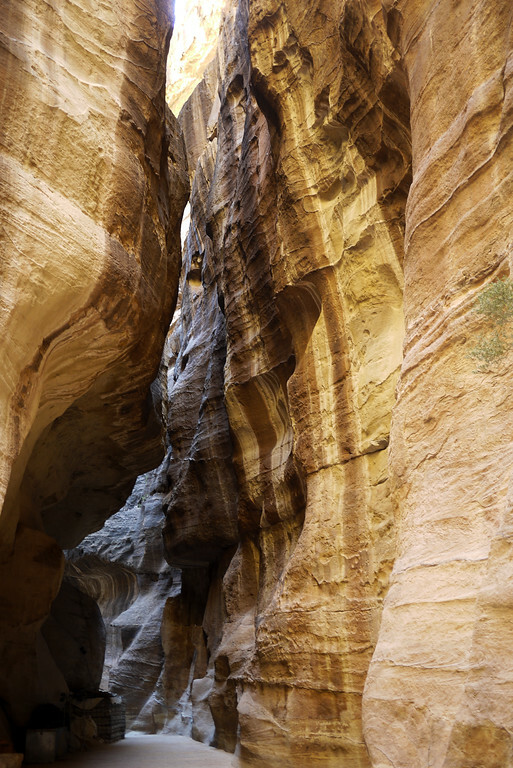 Looking down into the clefts of rock, I easily imagined why the Crusaders wrote Moses into Petra’s history. They allege that somewhere in that tangled maze below me, Moses struck a rock to bring forth water to the Israelites. The tale holds many possible truths, but no matter the verity, it forever linked Moses to this imposing sight. Which was a was a job well done for the Crusaders, who had no idea this city would last for so long. Taking in the aerial views was just the beginning of my visit. Unlike the epic descent of Indiana Jones into the ancient city, I took slower pace once inside. I shielded the bright sunlight with my red Jordanian keffiyeh. I walked the streets as the horse-drawn carriages passed, laden down with the tourists unable to navigate the miles of rocky roads winding through the city. 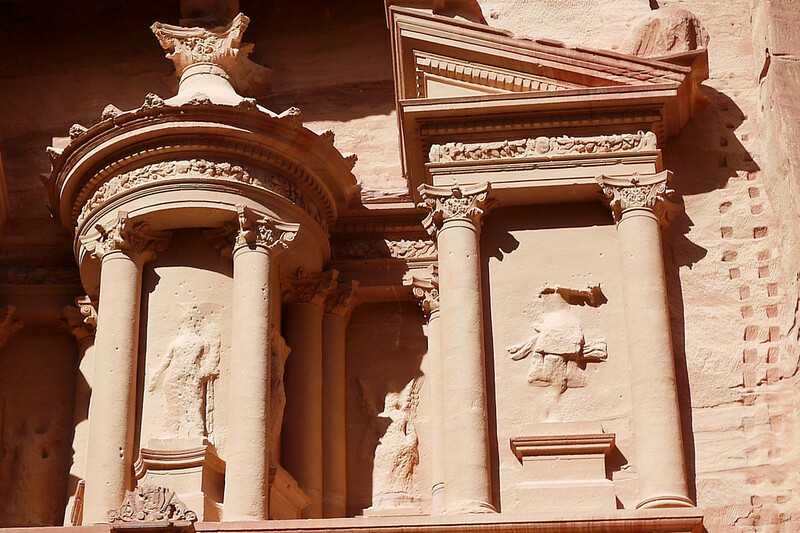 Within minutes of entering Petra, the first examples of rock-carved architecture danced to life from the sandstone. The precise, sharp lines jutting from the pale rocks appeared sliced from the rock a mere hundred years ago, instead of two thousand. Blue skies and red rocks tower over the pathways and roads in the ancient city of Petra, Jordan. I looked at those rocks with a snap of realization. This day at Petra isn’t akin to walking through a museum, with its carefully displayed information and artifact-filled glass domes. Petra was once a thriving city. It was a hub on the caravan trade route, meaning the city holds miles of roads, paths, and structures. Each piece of their civilization is still standing in its original spot, open to the elements and to the imposing blue skies. Well, blue skies for a bit. The white sunshine dimmed as we entered a deep cleft in the rocks. Narrow and tunnel-like inside, the sun was a mere blip overhead. Sprinkles of sunlight darted through the cracks as my eyes tracked up toward the sporadic patches of blue. The passageways unfolded slowly. Like a small ant, I scurried between the rocks, each one imposing in its stark rise from the sandy floor. By the time I entered the rock passageway that leads to the Treasury, I was a speck compared to the soaring height surrounding me. The walls loomed overhead. Each smooth, calm surface belied the ancient earthquake that ripped the rocks apart into the current chasm. The size of this entire site intimidated me. Once we entered a small open courtyard, I noticed a carved channel gently sloping down, descending with us deeper into the city. 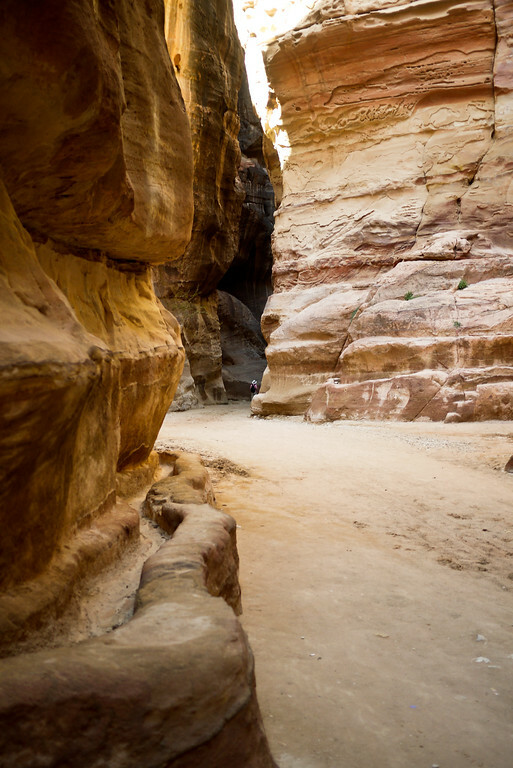 The shallow channel was a clever way for the Nabateans to carry fresh water throughout the city and combat the dry, arid temperatures. The desert climate is inhospitable to a city-dweller like myself. And yet, like the Romans, the Nabatean created a rain-collection, storage, and transportation system that made this huge city an oasis in the middle of a seemingly stark, dry desert. Unlike the Romans though, the Nabatean left few clues about the whys and the hows. An hour after walking into Petra, I had finally penetrated the city deep enough to pass through the Siq. 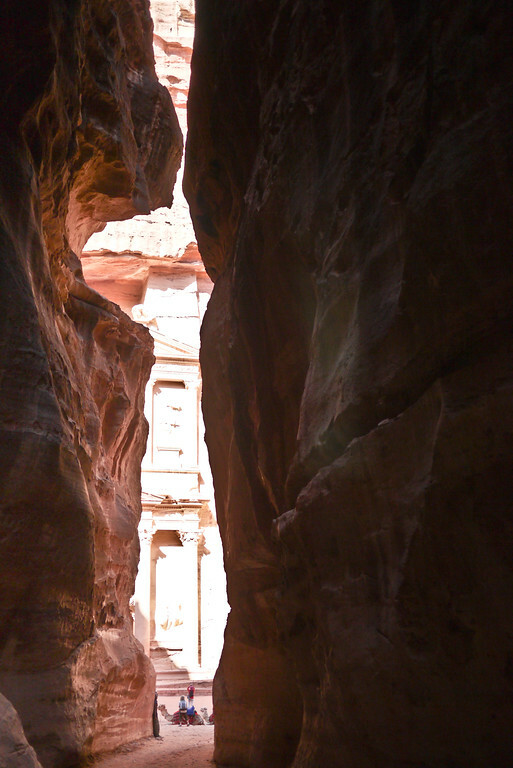 This is the final narrow pathway guarding the Al Khazneh, better known as Petra’s Treasury. The keyhole-like cleft in the rock teases as you approach. The delicate carvings flutter in and out of view as you make the approach. The Treasury building was taller than I imagined. It was intricate, with fine detailing on the pillars and columns. Likely carved around 100 B.C.E., the elements etched into the soft sandstone rock speak to why so many myths and stories circulate today. Is there a bounty of treasure hidden under the pink carved rock? Throughout the decades, many have believed this story. The pockmarked surface from gun shots aimed at the upper urn speak to a shared yearning. Each gunshot represented someone’s dream for undiscovered treasures. Couldn’t pass up the opportunity to prove I was here! 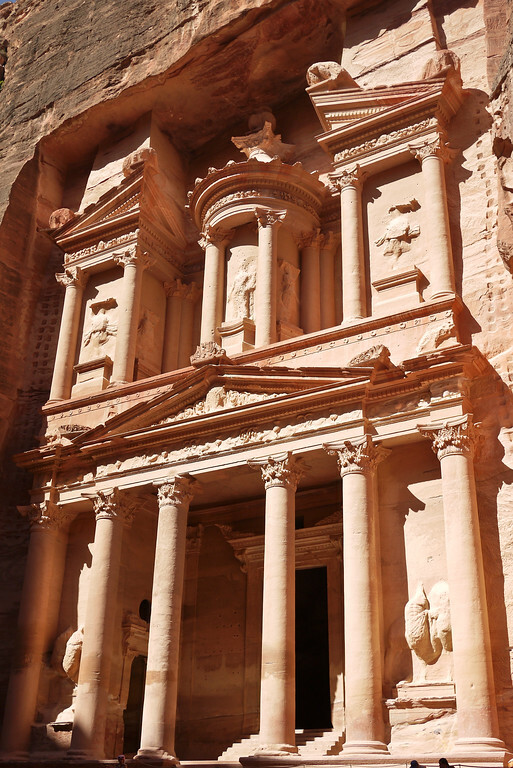 This is the famous Treasury building and one of the first sites you pass as you enter Petra’s ancient city. Archaeologists discount claims that the Nabatea built the Treasury’s elaborate façade to house the booty of an Egyptian Pharaoh. While a great dream, the urn is solid sandstone—no hidden treasures. The historians counter that the Treasury is—like many of the other huge sandstone façades—a colossal burial tomb. Little is actually known about the Nabataean Kingdom. In my mind, I look at smooth columns and eroded statues and imagine the mythological gods and goddess that once adorned the surface. These imagined symbols of Nabataean faith would have jutted life-like out of the sandstone, and then journeyed through the day as a riot of colors matching the sun’s movement across the sky. Rose-red in the soft morning light would give way to yellows and browns in the harsh light of midday before a burnt, deep orange would settle over the sandstone gods as the sun took a final bow to the creative imagination and skill of the Nabatean. My imaginations wandered far at these first glimpses into Petra’s history. My fanciful imaginings taking flight with the Nabatean gods that may have never existed. With all that swimming in my head, I walked into Street of Facades. Rather than a street, however it’s a parade of carved tombs. While the intricacies of each individual tomb pales comparison to the Treasury, when viewed in succession they are gorgeous in their own right. While my mind boggled at the city, it was really just a warm up for the city that would unfold in front of me. I hadn’t yet actually entered the heart of the city at that point. As the wide expanse of what was once a bustling city opened up before me, the beauty awed me. A tethered camel rests near the Street of Facades. 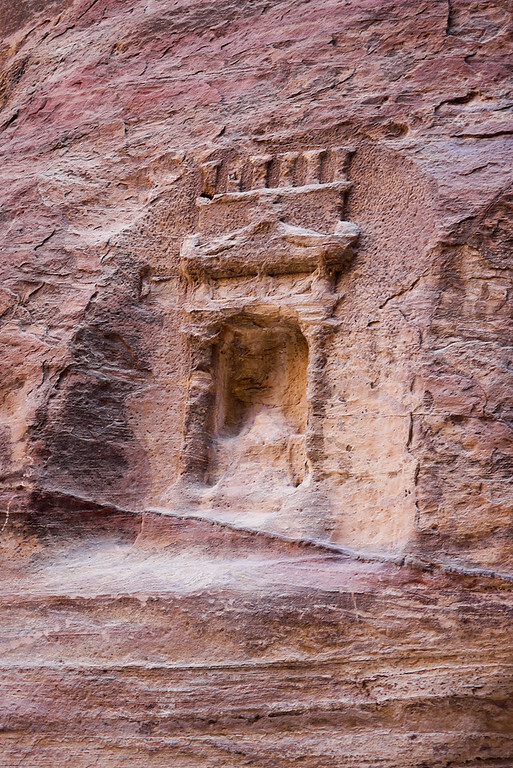 Small homes and structures are carved right into the rocks at Petra. Once you enter the heart of the city, the rocks in all direction hold these small openings, indicating that it was a thriving city housing thousands. 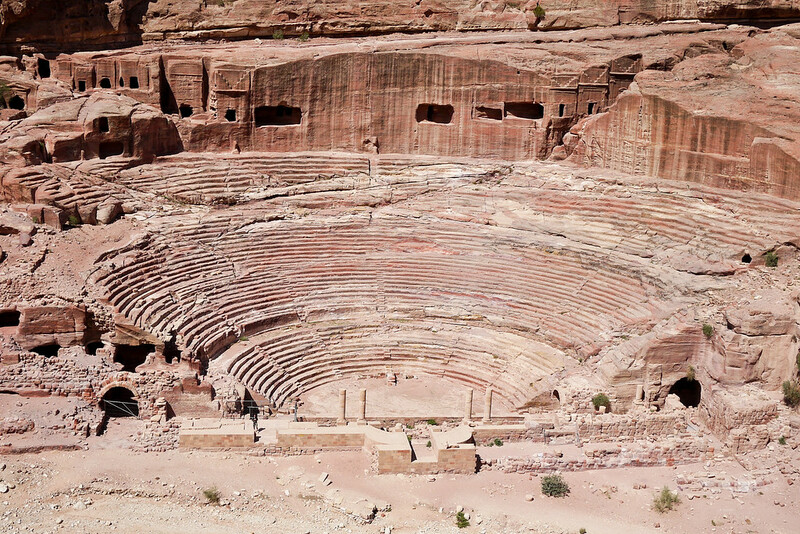 The huge amphitheatre still stands in the harsh mid-day Jordanian sun. Dark black holes dotted every rock wall within sight. Miles and miles of sandstone rocks held enough hidden housing to hold thousands. And like most cities, the large Roman-style amphitheater sits prominently within the center of town. Across from the amphitheatre stands yet another huge wall of tombs rising from the rocks. Without written documents from the time, however, the exact function of each building and carving remains a mystery. Despite being long gone, the Nabataean continue to closely guard their secrets for another millennium. I wandered more and examined the small details of this huge ancient city. Up close, the rock revealed layers upon layers of tinted sandstone. Ribbons of red, orange, yellow and brown created distinct patterns on the columns and tombs. I hadn’t before realized that it’s this inherent quality unique to sandstone that lends Petra’s tombs regal elegance and lasting beauty. No paint, design, nor ornate intricacies could have ever matched nature’s paintbrush. 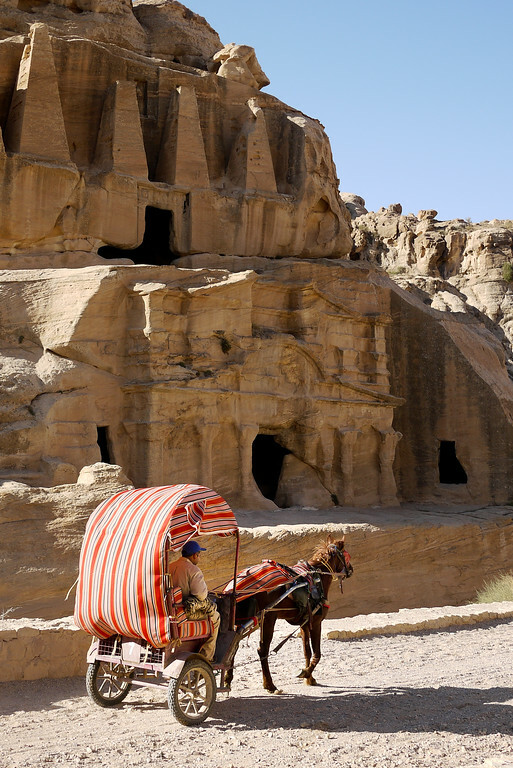 Although I hiked the modern paths carved into the desert for tourists, the curve of the current roads echo the streets that bore the Nabatean’s camels and caravans. It’s these very streets that populate our ancient stories, myths, and religious texts. The looming tombs visible are visible in the distance. They show how Petra is carved directly into the domed rocks. It’s the most remarkable site to see both up close, and to see the scale and size of it from a distance. Inside a room carved directly into Jordan’s soft, beautiful sandstone. These gorgeous layers of sandstone form the foundation of every single building in Petra, and it’s only truly visible once you are right up next to the structure. 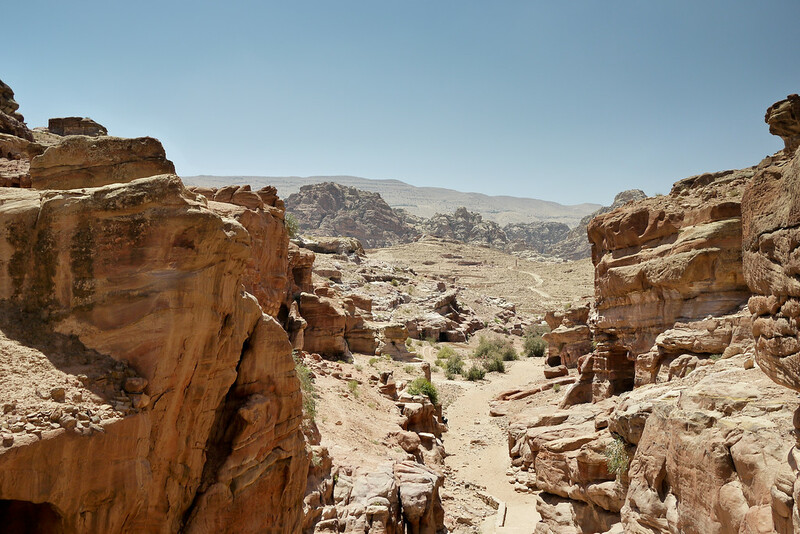 Once leaving behind the heart of the ancient city, it’s a dry and sunny hike up to the Petra’s Ad-Dayr Monastery. A pinks sunset riots over the Petra Valley from a small park in Wadi Musa, Jordan. Capping off the day at Petra, I hiked to the Monastery, Ad-Dayr. This site sits high on a mountainside near the Treasury building, and it’s carved directly into a raw wall of rock . Although not as famous as Petra’s Treasury down below, I loved this site. The Petra Monastery shows the grand scale of these structures. Because of the confining space near the Treasury, it’s hard to properly get the scope. These buildings are directly into the tall, sheer mountainsides. The Monastery—likely also a tomb but re-purposed by the Crusaders and those later in history—perches tall and proud against the cerulean sky. Looking at it is marvelous. How has this soft sandstone stood for thousands of years? The pillars on the façade are smooth and silky from afar. 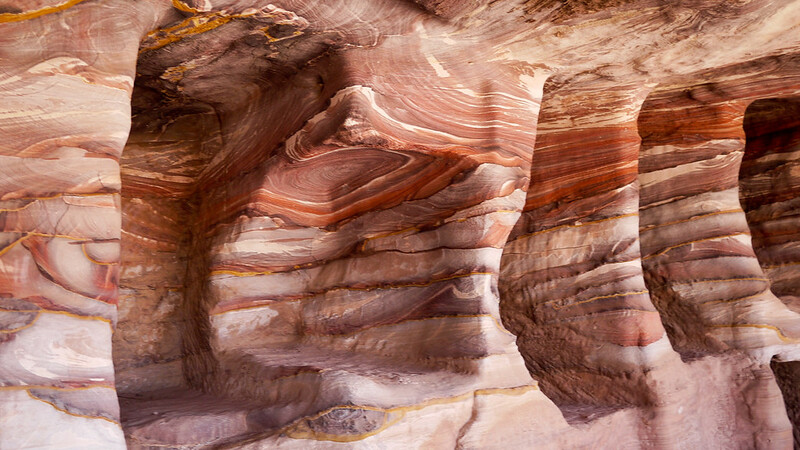 Each column shows the ribbons of layered sandstone carefully carved two thousand years ago. It’s hard to imagine these structures were ever more impressive than they are now. I can scarcely believe the structures possessed even more natural beauty at the heyday of the Nabataean civilization? 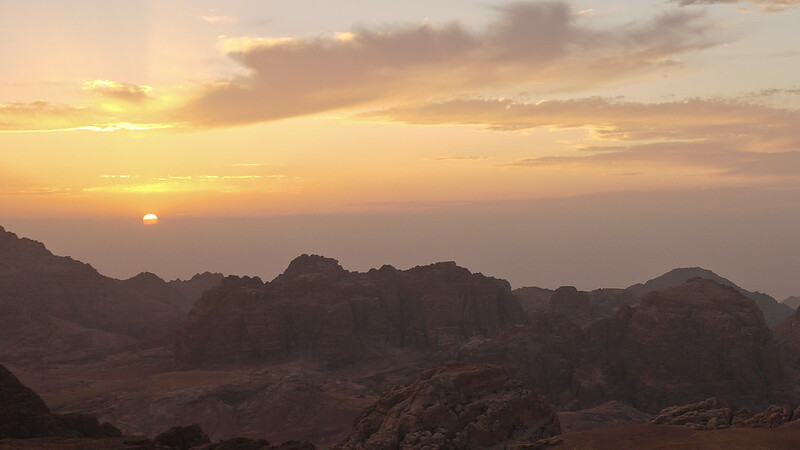 After leaving the ancient city, I watched sunset over the Petra valley. Like my first moments near the Treasury, I fell into a revere. My thoughts wandered through the unknowns and pondered the centuries of myths and legends surrounding Petra. In the face of little hard data, our collective romanticism creeps into any conversation about Petra. As a modern society, we have few hard fact and instead we can only imagine the daily lives of the Nabatean. They fought against the Romans, another powerful ancient civilization, for control. 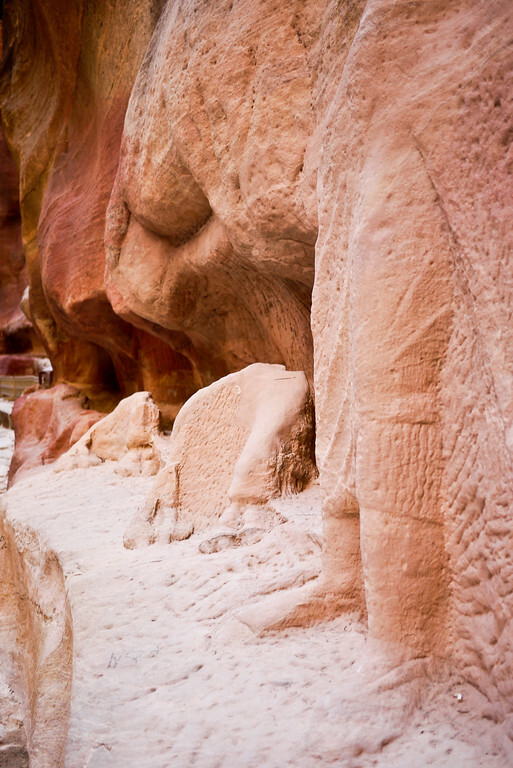 Their presence shifted the power for centuries and the ancient city of Petra is the epicenter of our cultural history. This region is considered the cradle of civilization. It rings true. 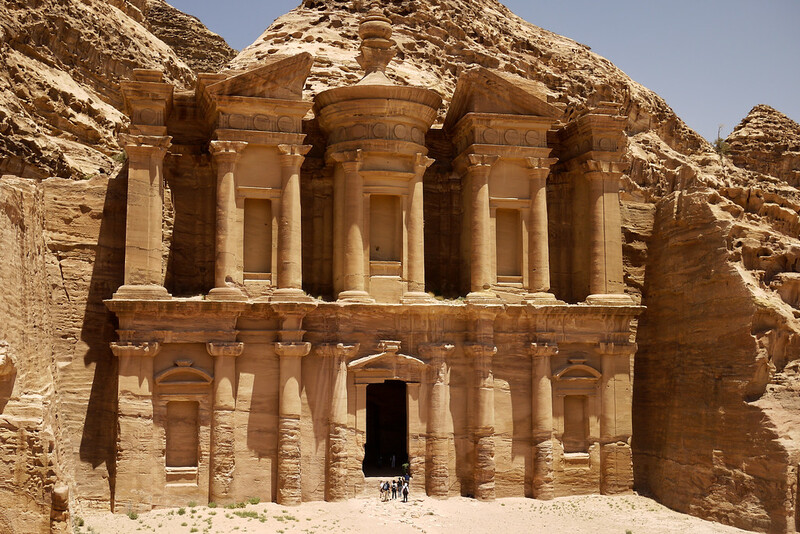 Looking through the complexities of Petra and the biblical stories that played out in the deserts and plains, it’s easy to let imagination take flight and fancy some of these myths and legends just might be true. Petra: Jordan’s Extraordinary Ancient City: This is a beautiful hardcover print book that you can find for just a few dollars online. It has a well-told history of the city and beautiful photographs. Married to a Bedouin: A fascinating account of a Western woman who fell in love with a Bedouin in 1978 and moved to Petra to marry and be with him. It gives a living account of what it’s like to live not just within this culture, but at this beautiful ancient site. 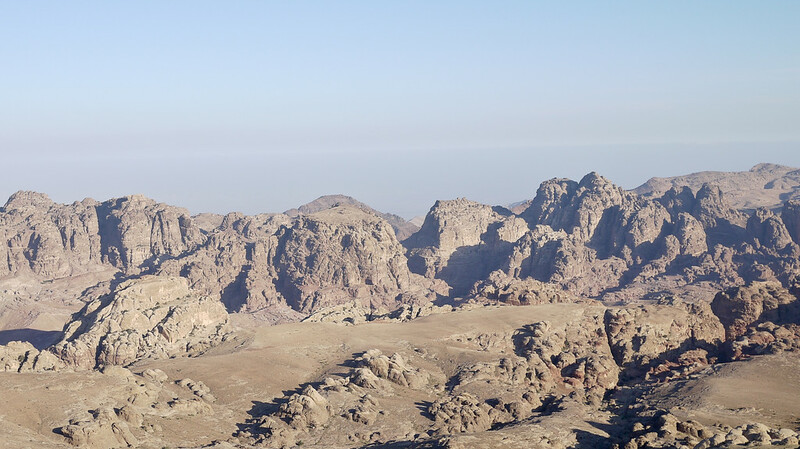 Hiking Jordan: If you’re keen on an off-beat way to see this gorgeous area then this is your book. Discover the Lost City of Petra: An interesting podcast episode about the history and what it’s like to travel to Petra. QUICK TIPS: If you’re exploring the rest of Jordan, the Jordan Lonely Planet is the most recent and reliable guides to this region. The Visit Petra site is run by the government and has the latest ticket prices, as well as tips to stay safe when you’re there. What to bring: Wear comfortable shoes and bring water, sunscreen, and a hat. Eat and drink: I grabbed a delicious mint lemonade at the small restaurant near the Monastery and it was a fabulous way to end the day. “Petra is believed to have been settled as early as 9,000 BC” …Wiki page. Is this the same time frame that you refer to in the “B.C.E.” reference on your blog??? What time is B.C.E.??? Is that some other time than That we all know. I don’t know BCE What is BCE? 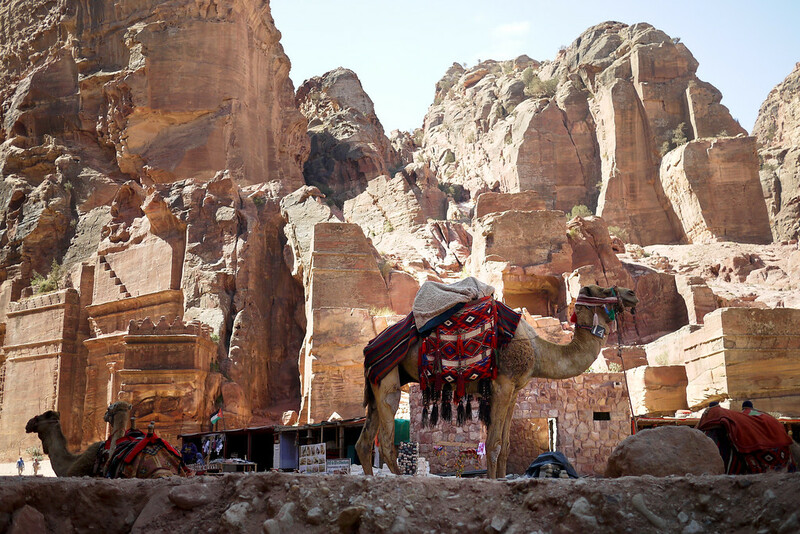 Great photos of city of Petra. I think it would be more amazing to see with our naked eyes.Looks absolutely beautiful. Thanks for sharing your trip. We are inspired to visit Petra in our next vacation. Thank you! So glad that you enjoyed the post and photos — you should absolutely consider it for your next trip, it’s a gorgeous spot. WOW…That was an amazing read …I was just collecting info for my students and found out this was on the Wonders lists. On reading your experience, I wish I am able to go but then reading your description has made me able to visualize it perfectly. You have to check out Madein Saleh in Al Ula, Saudi Arabia, the sister capital of Petra. The Saudi government is opening its doors to tourists nowadays. We just went there and there’s less people. Our next stop is Petra in 2018. A fascinating story well told makes me interested to know more.Very soon my son and his wife will be visiting Petra and I will wait for their experience. I hope they have a wonderful time! It’s such a special place. You will no doubt be amazed, the city overwhelms with its beauty :) Safe travels! Awesome pictures! That must have been a fantastic trip! I’ve been thinking of making a trip to Israel, and now I want to include Jordan as well. Thanks for sharing your trip! It is tough to actually encompass what it’s like to stand there in front of the Treasury and rest of the ruins and describe what it feels like—amazing! :) Sounds like you had a wonderful time exploring the ruins as well, and dreaming up the various stories; thanks for stopping in and sharing your experience! beautiful photos! jordan is definitely on my list now! Lovely post about a very popular destination. Looks absolutely awesome, can never tire of the images each one seems to draw me still closer to the place. It is obvious you found it fascinating it is always fantastic walking amongst the great places of World history and thinking back to how they must have been in their heyday. I totally understand what you mean how the soft sandstone has managed to resist the raveages of time and the elements. Thanks for sharing. It’s like stepping back in time when you walk through these ancient cities and see the carvings and very specific remnants of a human presence that once shaped these sites…I love it! :) Thanks for weighing in Iain! We’re thinking of putting Jordan on our itinerary for the end of the year. These photos of Petra are incredible but I suspect it would be even more amazing in person. Thanks for all the great background on the site! Your pictures are insanely gorgeous and your travel narrative is spectacular! Bravo for an awesome post!!! Great photos and ever since vewing the Transformers movie I have been intrigued by Petra. How did you managed the photo of yourself? Petra looks like a great place to visit and I am surprised that sandstone has lasted for so long. Thanks Kirk! It was a truly spectacular place to visit, and I too loved those scenes in the Transformer movie :) As for the self-portrait, my guide took it for me! 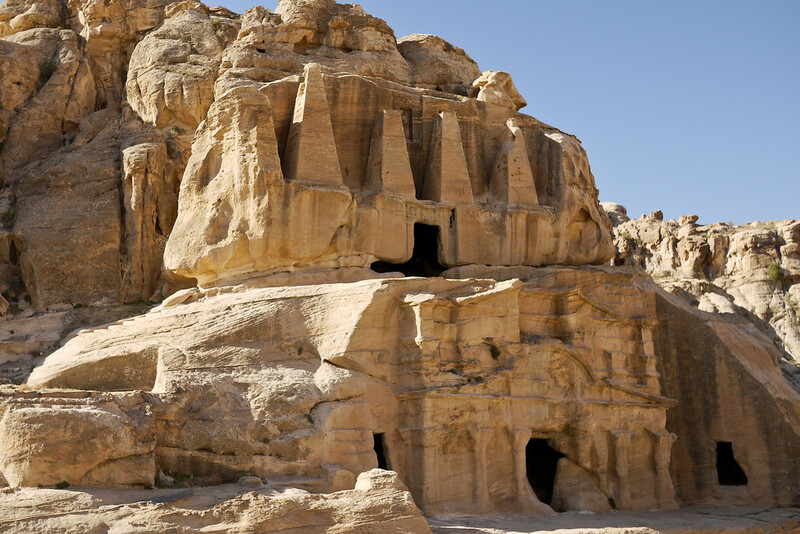 Fun Fact: There is another Nabataean south of Petra in Saudi Arabia called Al-Hijr. If you see photos it is like a mini-Petra. Shannon, am encountering your blog for the first time and it won’t be the last. I LOVE your writing: such eloquent, incisive prose and the reluctance to accept things as staus quo makes for good tales. Thanks for the photos on Petra, a place that piqued my imagination in no small part thanks to “An Idiot Abroad” (ever watched that show? ).